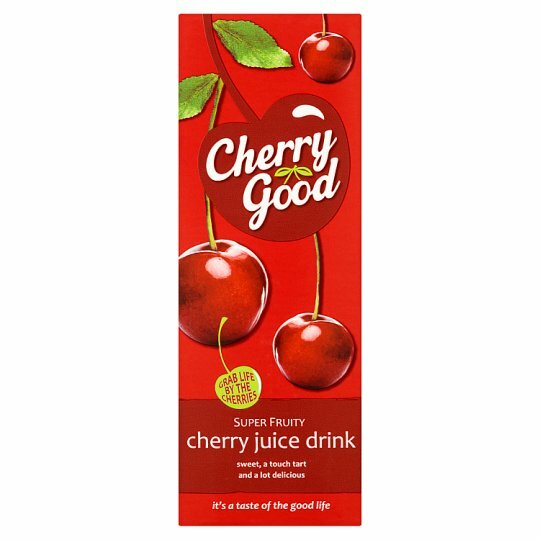 Bursting with flavour, Cherry Good's amazing taste comes straight from the delicious juice of pure cherries we cram into every carton. Sweet, a touch Tart and a lot Delicious, it's packed full of luscious refreshment to get you blossoming with happiness. Ready to grab life by the cherries? Start your day with right way with a couple of glasses of refreshing Cherry Good. When you're out and about, top up your refreshment levels with a handy Cherry Good to Go mini carton. Light up your nights with a delicious Cherry Good cocktail - you'll find loads of exciting ideas on our website. Once opened, keep refrigerated, store in an upright position and drink within 4 days., For Best Before End: see top of pack.